The Calphalon Barware Stainless Steel Ice Bucket Set combines sturdy construction with a sophisticated, modern design that looks great in any kitchen or bar. 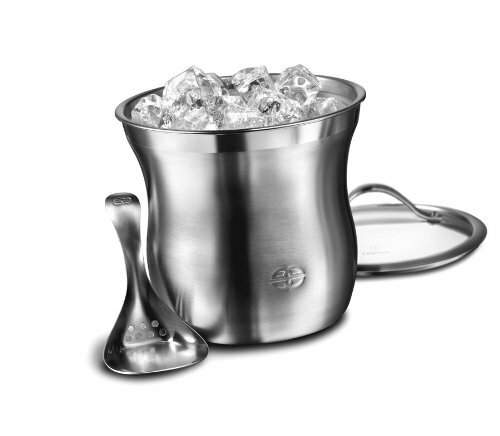 Featuring a double-walled design that prevents moisture from forming on the exterior, this ice bucket helps you keep ice at an appropriate serving temperature. A perforated scoop drains melted water away from the ice to slow down melting, while a clear glass cover lets you check the ice level at a glance. This ice bucket is dishwasher safe. Double-walled construction helps prevents mositure from forming on exterior. Perforated scoop drains melted water from ice.